The broad phenotypic diversity displayed among species belonging to the Cucurbitaceae family for interesting agronomical traits is mostly under polygenic control. Important crops included in this family, such as melon, cucumber, watermelon and squash, have been studied intensively in the last decades to understand the genetic control of this diversity. 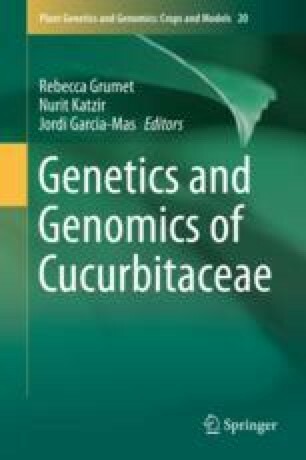 The development of genomic sequencing projects for different cucurbit species has facilitated the generation of saturated genetic maps, making possible the consistent identification and localization of QTLs involved in interesting traits related to yield, fruit quality, fruit morphology, vegetative growth or disease resistance, among others. In the current chapter, the mapping approaches for genetic dissection of complex traits in the four major cucurbit species mentioned above has been compiled, including a summary of the identified QTLs for the most relevant traits for each species. This work has been funded in part by Spanish Ministry of Economy and Competitiveness grants AGL2012-40130-C02-02 and AGL2015-64625-C02-02. Bu F, Chen H, Shi Q, Zhou Q, Gao D, Zhang Z, Huang S. A major quantitative trait locus conferring subgynoecy in cucumber. Theor Appl Genet. 2016;129:97–104. doi: 10.1007/s00122-015-2612-z.